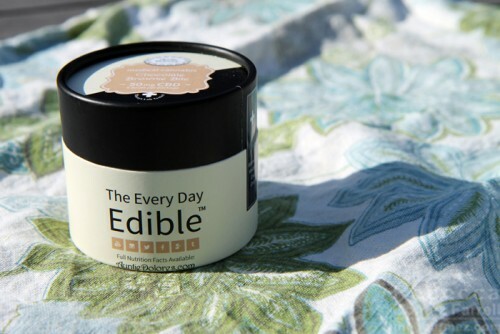 Last month, I posted my first review of a cannabidiol product. It was ViPova Tea, and part of my willingness to review it was the understanding that ViPova contains hemp-derived CBD only, and no discernible THC, which is the psychoactive component of marijuana. That’s important, because I do not have a medical marijuana card and frankly, the smell of marijuana is usually enough to turn my stomach, never mind its effects. Yet I recognize that cannabinoids are giving a lot of people with chronic pain and other health conditions relief from that pain, so I’m fully on board with supporting it. Just not consuming it myself. Products containing only hemp-derived CBD oil are legal in the USA (to my fullest understanding of the law, which is admittedly not comprehensive), and so when asked if I would review another, I said, sure, why not? I can be a food critic regardless of what that food contains. And thus, I agreed to try an edible made with CBD oil from Oakland-based Auntie Dolores, a name inspired by Dolores Park across the Bay. 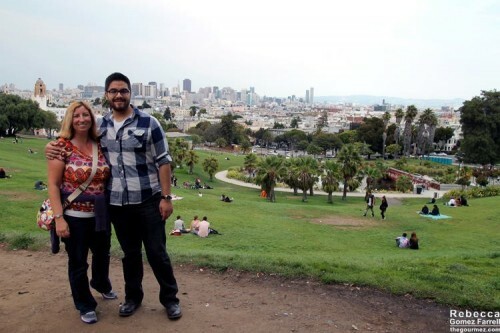 My sister and cousin at Dolores Park. Auntie Dolores can be translated as “anti-pain,” if you’re getting whimsical and clever enough. The company explains their philosophy behind their goods in great detail on the website. I would summarize it as keeping a focus on quality ingredients and processes in all aspects of producing edibles, not just making sure the cannibidiols get delivered adequately in the final product. And what this dark chocolate, vegan, low-glycemic, preservative-free brownie is delivered in is adorable! Reassuring, but I still didn’t get to try it. Why? My husband, who has a medical card, misinterpreted my musings over the legality as an invitation to try it out himself. I had placed the brownie, slightly larger than a silver dollar in circumference and about an inch high, in the freezer as the instructions recommend. Alas, when I went to the freezer to retrieve it, there was none left! So I have forced him to give his opinion. He found it quite dense and chocolatey, as is typical for the THC edibles he’s tried, but it didn’t have the noxious taste that can overwhelm those edibles, a definite improvement. Judging it next to an actual brownie, he would still take the brownie, but compared to other edibles, Auntie Dolores wins for flavor and quality easily. As for effects? He felt nothing after eating the whole brownie, which Auntie Dolores counts as five doses—10 mg CBD in each. Nothing felt is a conclusive absence of notable THC in my book, so if you’re looking for health-related relief without THC properties, this may work for you, and give you those extra endorphins from eating chocolate! You can order the CBD chocolate brownie right here. 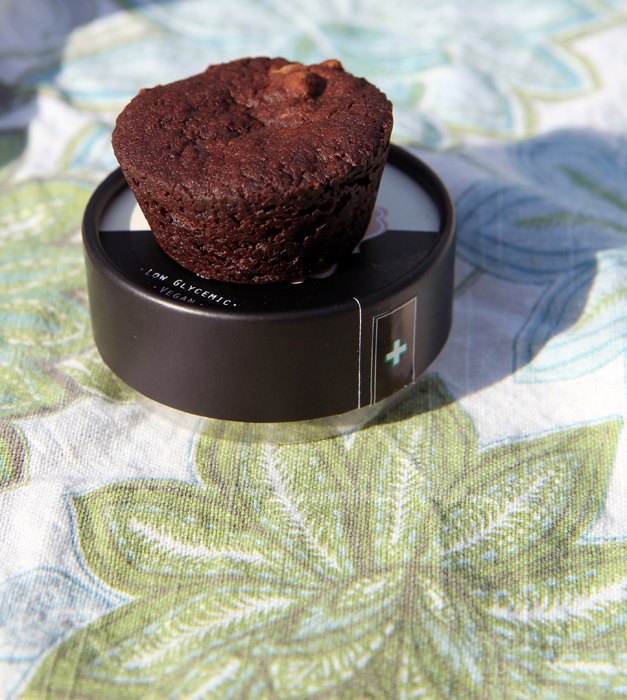 Obligatory disclaimer: The brownie was provided as a free sample for review…to me, not my husband. Sometimes, that’s just how the brownie crumbles.